Thanks to our sponsor, See's Candies, for this great fundraising post! 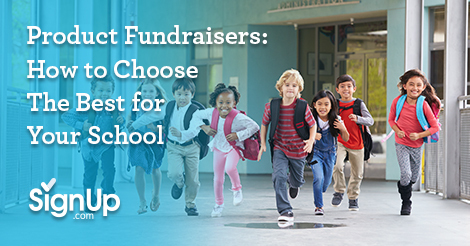 If you are trying to decide which fundraising product to sell for the upcoming school year and feeling overwhelmed, you’re not alone! What used to be confined to a small array of choices for the organization or school — popcorn, gift wrap, magazines and catalog sales – is now an astonishing array of products and services. In the US and Canada, there are currently more than 2,000 fundraising companies in operation! If you are wondering how to make sense of all of the offerings and choose the best for your school, we’ve got your answer! First, know what works best for YOUR organization’s resources. Special events and product sales are not mutually exclusive--many organizations find a combination of tactics key to a robust fundraising plan. But according to a survey of school parent groups, sales of products (i.e. gift wrap, popcorn, books, gift items, boxed chocolates etc.) consistently yield the best results per leadership hour compared to other types of fundraising drives, especially for schools and organizations without the deep volunteer reserves needed to stage a large special event. Product sales are typically the lowest drain on volunteers, utilizing an average of 7 volunteers versus the astounding average of 59 volunteers needed for a large event like a carnival, auction or fun-run! Once you’ve chosen a quality product, add a tiny bit of effort getting the word out and the product will almost sell itself! It’s possible to do real harm to your long-term fundraising success by choosing inferior products. And if you choose a product that’s a mismatch with your community, you could expend a lot of effort for a very minimal return. Before you choose your product, know your audience. Examine the quality of what you are selling and ask yourself if it fits the audience’s expectations. Will they likely want to buy more than one or two? There are a lot of choices when it comes to picking the right product for your organization’s fundraising campaign, but you can’t go wrong if you choose your product based on the end user first, and then factor in which company is the easiest to partner with in launching your effort. If you choose a quality product that appeals to your audience they will buy lots of it, and if you pick a company that makes it easy for you to sell, soon you’ll have all the funds you need to serve your mission. We’re excited to share one of the best products we’ve found for fundraising: See’s Candies. It’s not just the idea of selling chocolate - a product that practically sells itself - but it’s the idea of selling chocolate of such surpassing quality that everyone’s eyes light up at the thought. See’s Candies has been partnering with schools and nonprofit organizations for decades, returning up to 50% of the profits back to the communities that enjoy their chocolates. The company provides real support in the form of live humans to help you, all of the free marketing materials you need, and a straightforward profit structure. Go here to find out more! With your organization’s resources and market in mind, achieving your fundraising goals (profits raised + volunteer support + amazing product) will be effortless and simple when you offer See’s Candies as the go-to Holiday fundraiser. Learn more.